My sister in-laws and I got together and decided to make this. It was SO easy (you don’t even need a sewing machine), and they turned out fabulous! Depending on where you get the fabric, you can make it sooo cheap. I believe it retailed for around $80 in the original magazine that inspired the DIY post we found. I promise it won’t cost you nearly that much. body size). Really, any stretchy material that won’t fray will work. 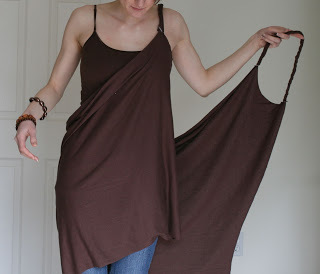 First, wrap fabric lengthwise around your body, from shoulder to shoulder, to make sure it fits. 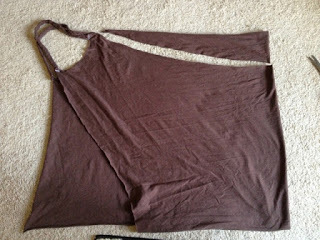 Fold fabric in half hamburger style and cut a “c” to form the armpit “hole”. Don’t make the cut too long or deep. If you cut the “c”s too big, the wrap will be too small. We found that out the hard way when we got together to do this. We were trying them on and couldn’t help laughing and asking “was this designed f or an 8 year-old?” After some investigating and some trial and error, we figure we’d cut the c’s too long/ deep. So I’m saving you the hassle of figuring that out the hard way and telling you that secret now. Cut about 5 inches from the bottom of you’re wrap. Cut that in half, and then into three strips so that you have 6 strips that are fairly equal in size. 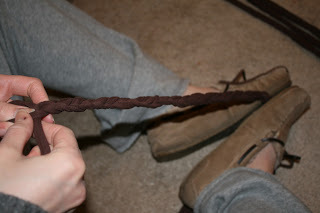 Knot three strips together and then with your feet or a friend, begin braiding. Have the friend (or your feet) hold one end so that it can stay tight. Knot the end of the braided strap, making sure it will fit you’re shoulder comfortably and that the two straps are equal in size. I rarely make a recipe smaller than what it calls for. I figure if I'm putting in the time and effort to chop an onion, I'll chop the whole thing rather than half of it. I never regret making more than needed. Just be sure to be wise about your leftovers, freeze them properly or use them in a timely manner. Pin straps on and try on the wrap. Adjust the strap until it fits. Sew on straps (you can just hand sew). Try on the wrap again. Decide how long you want it to be. Cut off the bottom. 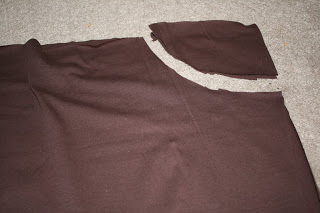 If you decide to hem (although it is not necessary, especially if you have a fabric that won’t fray), leave a couple extra inches on the bottom. Angle the side that will wrap in the front by cutting a small triangle into the fabric. This gives it a nice, finished look. If the back is bunching too much, taper cut out some of the back. Start with 4 inches deep and take out more only if needed. The picture shown above has already been angled, (you can see it in the fabric), and the bunching is what is cut out.